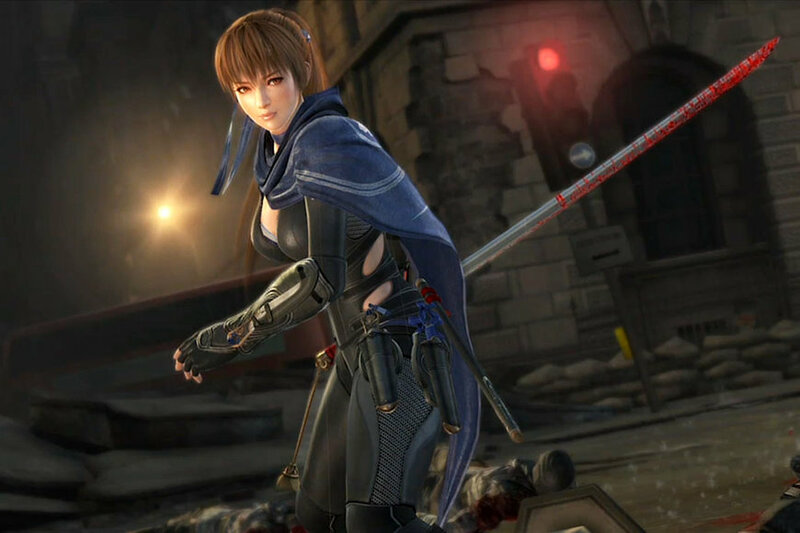 Ninja Gaiden 3: Razor's Edge for Wii U will add Kasumi of the Dead or Alive series as a playable character, Nintendo announced today during a Nintendo Direct presentation. Kasumi will be available as a free update by connecting the Wii U online, according to Nintendo. She will be joining series protagonists Ryu and Ayame along with recently-announced Momiji from 2008's Ninja Gaiden: Dragon Sword in the game's playable character roster. Kasumi and Momiji will be available as part of downloadable patch coming in December. Ninja Gaiden 3: Razor's Edge is currently available for Wii U. She's my favorite DOA characters but I'm still going to hold out for an official NG3 Sigma anouncment. Looks like she'll be using a katana instead of her kodachi. Now they try everything to sell that game, lol. For that matter, why don't they add a playable Genshin? Fighting with two weapons at once (the sword and the claw) would surely be refreshing. He already has plenty of combos too. I'm not against Kasumi though. That would make her appearance in Sigma 2 less pointless. I need to play Ninja Gaiden 2 again to see how he used his sword. I can't imagine the moves looking so cool when it's wielded that way. I guess I'll have to wait until they release a gameplay trailer for Kasumi. I hope she has a lot of teleport moves. Team Ninja is really making it difficult to refrain from getting a Wii U lol. Fans have been asking for Kasumi to be a playable character for years (since the 1st Sigma), so it's about time. A pity that they waited for an exclusive Wii U title to do so, but hopefully we'll get a Sigma 3 eventually. It'll be very interesting to see Kasumi in a game like this. I remember back in the day, everyone said that Kasumi is too docile and passive to really fit into such a bloody and violent game, which was indeed true. Even so, it'll be great to see Kasumi cut loose and fight like a true ninja. From the looks of it, those Cherry Blossom petal effects that usually occur with Kasumi's fighting style are present, which is cool. I'm hoping they give her a lot of teleportation techniques, since that's her most notable attribute in combat. It's awesome that she wields a Katana with a reverse grip, but I doubt she'll fight like Genshin. I don't see her having a similar style to Ayane (a lot of quick spins) either. They'll probably give her a very unique method of fighting to distinguish herself from the other characters. I wonder what her Ninpo will be. It would be awesome if they brought back the Art of Inazuma and maybe give the lightning a pinkish color to it (since most of Kasumi's special effects are usually pink). Kasumi in Ninja Gaiden is plain ridiculous. Ninja Gaiden =/= Dead or Alive. Ayane was ok as a guest star (like in the first NG) but now it's getting absurd, the two universes are way too different to be mixed. Why don't they develop the new Ninja Gaiden 3 characters??! Regent of Mask playable would have been much more interesting and badass! Team Ninja lust for money is sickening, they only recycle things that already exist and mix them to make a new to get more profits. And the DOA and NG universes overlap story wise as well. But if it's free and already� ready, why don't they put all this directly on the disc? For NG3 they had waited a month to release the claws and the scythe, so the websites reviewed the already not-fantastic game as if there was only one weapon� same deal here, if they made those characters in-game unlockables instead of delayed DLC, that would improve the game's replay value and its image. Look at Bayonetta: no DLCs, but a truckload of unlockable content, and that's part of what makes the game awesome. Who cares? As a bonus character, he would be awesome.